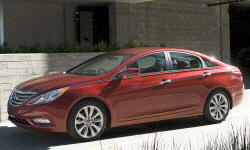 Why the 2011 Hyundai Sonata? The SE Turbo Sonata out handles and powers most cars and all in it's class. It has a sport-tuned suspension and steering system ONLY on the SE's and deleted on Limiteds. I also drive a 370Z Nissan and it handles much like it, honestly. 30mpg avg. LOADED with ALL the bells and whistles you'd pay A LOT extra for on it's competitors. Nissan, Honda and Toyota make you add pricey package after package for what comes standard here. To be fair, to get the sunroof, you HAVE to add the NAV pack.